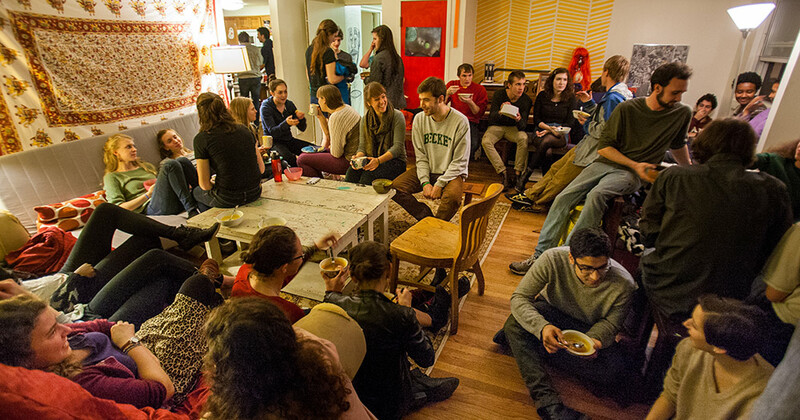 First-year students are required to live on campus so that they may fully take part in all of the First-Year programs, and become acquainted with the Haverford community. 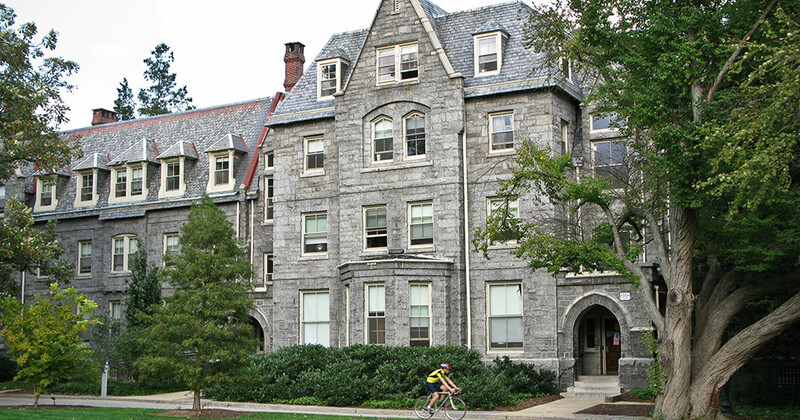 First-year students are assigned housing in one of four residence halls: Barclay Hall, Gummere Hall, Haverford College Apartments (HCA), or Tritton Hall. Housing assignments are completed during the summer and emailed to first-year students at their Haverford email address in late July. All first-year students must be on the full meal plan. Students are responsible for providing their own bedding (sheets, mattress covers, blankets, bedspreads), pillow, blankets, towels, wastebasket, clothes hangers, and lamps. All mattresses are extra-long and will require sheets measuring 36" x 80" x 6". Vacuum cleaners are available for use in all of the residence halls. Wireless Internet is available in the residence halls. Landline telephones are not provided in student rooms. There are washers and dryers in all First-Year residence halls. Still have questions? Visit Living at Haverford for more information on what to not to bring, your mailing address, policies, and more! Housing for first-year students in Barclay Hall is a single-gender by room or suite and all gender by floor. First-year students are housed in single-gender doubles or in singles configured either as two-person single-gender suites, or singles that open directly onto the hallway. The College provides each Barclay resident with a bed, desk, chair, small bookshelf, dresser and a closet or wardrobe. All windows have shades or blinds, and rooms are carpeted. Barclay is a designated smoke-free building. For more information please see "Residence Halls". Gummere Hall is an all-gender residence hall that houses first-year students in single rooms. The majority of single rooms are arranged in clusters of four rooms and the other single rooms open directly onto the hallway. The College provides each Gummere student resident with a bed, desk, chair, small bookshelf, dresser and a closet or wardrobe. All windows have shades or blinds, and rooms are carpeted. Gummere is a designated smoke-free building. For more information please see "Residence Halls". A community dinner inside of one of the HCA apartments. 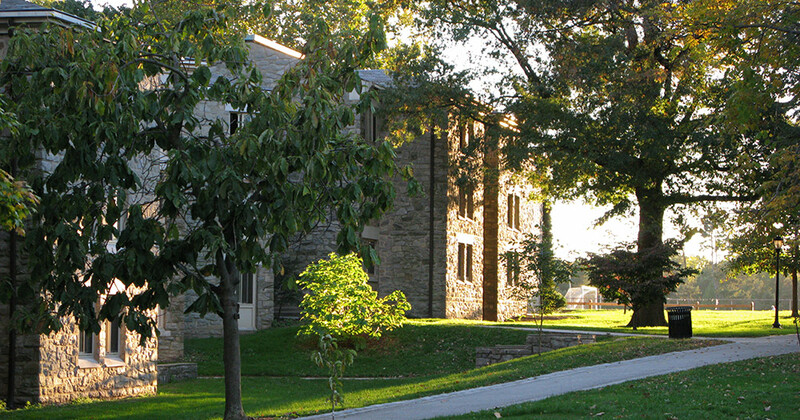 Haverford College Apartments (HCA) is a complex comprised of 21 garden-style, two story apartment buildings located at the south end of Haverford's campus, five of which are designated as First-Year buildings. Each building has eight apartments, with three two-bedroom apartments and a one-bedroom apartment on each floor. Each apartment has hardwood flooring, a bathroom, a living/dining area, closets, and a full kitchen. First-Year students are housed in double rooms in either a two-bedroom or a one-bedroom apartment that are single-gender by individual apartment, and all-gender by floor. The first floor in each of the First-Year buildings is arranged in an open floor plan that the entire first floor communally shares, and has one expanded and one regular kitchen and common spaces. The College provides each HCA resident with a bed, desk, chair, small bookshelf, and a dresser. All windows have blinds. The living room is furnished with seating for three or four, and a coffee table. In the kitchen, there is a full-sized refrigerator with a freezer, a stove, a sink with a garbage disposal, and storage cabinets. The kitchen does not have a microwave. A shower curtain is provided in the bathroom. Toilet paper is provided to each apartment on a routine basis. 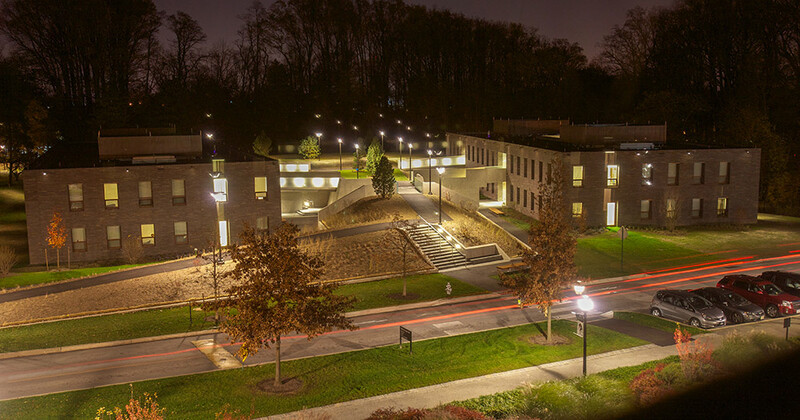 Tritton and Kim dormitories at night. The exterior of Tritton Hall. Tritton and Kim dormitories feature quiet study rooms on each floor. Tritton and Kim Halls feature single rooms, hardwood floors, two common areas, and a study room on each floor. 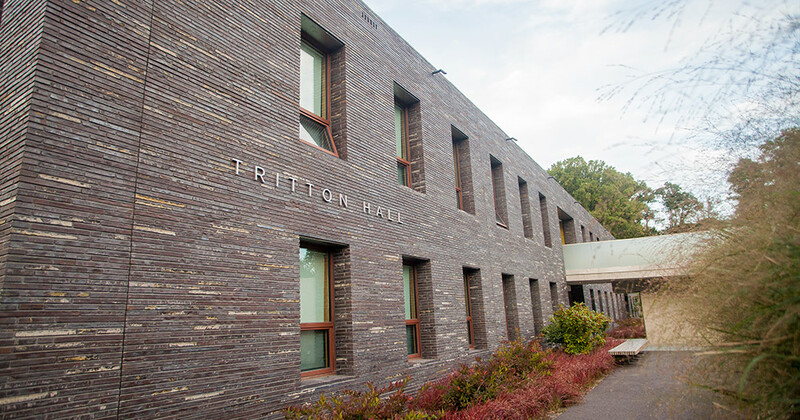 Tritton Hall is an all-gender residence hall that houses first-year students in single rooms that open onto a main hallway and is all-gender by floor. The College provides each Tritton resident with a bed, desk, chair, built in bookshelf, armoire and a closet.